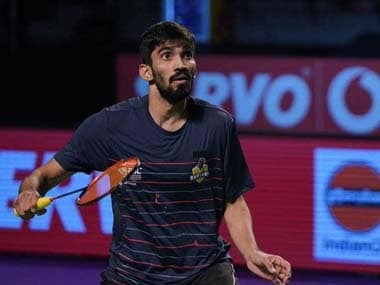 Sydney: Kidambi Srikanth continued his dream run and grabbed a third successive Superseries final spot at the Australian Open with a straight-game victory over China's Shi Yuqi on Friday. Srikanth, who had reached the summit clash in Singapore and Indonesia, joined Indonesia's Sony Dwi Kuncoro, Malaysia's Lee Chong Wei, the Chinese duo of Chen Long and Lin Dan to become only the fifth player in the world to contest three successive Superseries finals. A former World No 3, Srikanth, who had reached the semi-finals in the last edition, produced yet another near- perfect performance to outclass All England finalist Yuqi 21-10 21-14 in a 37-minute match to notch up his second win over the Chinese. 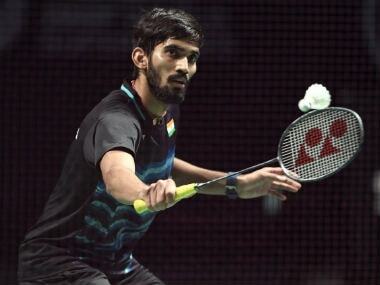 Srikanth had beaten him at the quarters of the Singapore Open in April. "It's a dream performance," said Srikanth, who had suffered a stress fracture in his right ankle after the Olympics. "I played a World Superseries final (Singapore Open) after two years, and then to play the next two finals is a dream for sure." "I was in control of the whole match, I didn't give him any easy points at the start. It's just that I had to stay there, he's someone who wants to keep the shuttle in play and goes for the odd shot, so I wanted to stay there and not give him easy points. I was in control at the net." Srikanth will play either reigning Olympic champion and two-time World champion and All-England champion Chen Long or Korea's Lee Hyun II in the finals. "I have no thoughts about the final, no thoughts about winning or losing. (If it is Chen Long) I've played him four or five times. Most times it was close. I played him twice this year, I lost 21-19 or so," he said. Srikanth and Shi engaged in long rallies with both the shuttlers staying away from the net early on. The Indian relied on strong returns to lead 9-6 in the first game. Srikanth showed better anticipation and immaculate stroke play to lead 11-7 at the break. He continued to dominate the proceedings with Shi hitting long, finding the nets. At 16-9, Srikanth had a service error as the shuttle went to the net. But that didn't affect his run as he continued to move ahead and reached the game point when the Chinese faltered with a net-stroke. The Indian seized the opportunity with a straight smash which left his opponent stranded. Shi took a slender early lead in the second game but Srikanth caught up at 2-2 and edged ahead with an onrushing return at the net. The duo engaged in some sensational rallies where both tried to surprise each other with odd shots. But it was Srikanth's brilliant net play which helped him to move to 7-6 with a backhand smash. Shi's every ploy was met with determination from Srikanth and it seemed the Chinese had run out of ideas. He did play some extraordinary strokes but the Indian was always a step ahead. He once again gained a three-point advantage at the interval with another attacking net play. After the break, the Chinese tried to be more aggressive but Srikanth managed to reach 15-8. Shi grabbed three straight points but another rally ended with his shuttle going long as Srikanth moved to 16-11. The Indian seemed in total control as he moved effortlessly to change positions from the forecourt to the back to eventually move to 19-13. Another stiff smash at the net and Srikanth had seven match points. He left one at the baseline but another jump cross court smash took him to the finals.